If you owned a Dreamcast back in the day, chances are you filled a VMU memory unit or two with save games. Wouldn’t it be great to revisit some of those save games on the emulator? Rather than starting your favourite games again, you can pick up exactly where you left off, only this time in high definition. Furthermore, if you encounter an emulator glitch further into your game, you can always transfer your save game back to the real Dreamcast and continue playing there. Luckily, it’s not too hard to transfer save games to and from a real Dreamcast. In this article, we’ll take a look at how to do this and what you need. In order to copy over your save games we’re going to need a few things. 1) A working Dreamcast console – The console must be able to boot from CD-R.
2) A Dreamcast serial to SD adapter and SD card. These little adapters plug into the back of the Dreamcast console. They’re typically home made, adapted from USB SD card readers. We got ours from this page on Facebook. 3) A copy of the homebrew Dreamcast software Dreamshell. You can download a copy of this software here. You will need a PC with a CD/DVD recorder in order to burn it to a disc. We used Dreamshell 4.0RC4. Be aware that Dreamshell takes a while to start up and can sometimes look like it’s crashed or frozen on a black screen. 4) If you want to burn your own copy of Dreamshell, you will need a copy of the DiscJuggler CD recording software. If you’re running Windows 10, see this article regarding installing DiscJuggler on your PC. To get started, make sure your Dreamcast is powered off and carefully insert your SD card reader. The fit is quite tight, but be careful not to apply too much force else you could damage your SD reader or your console. Now, pop the Dreamshell CD into your Dreamcast and power on. If your SD reader has a LED light on it, this light should be lit as soon as you power on the console. It may go out when Dreamshell has finished loading, but that’s normal. Once the Dreamshell desktop is displayed, use the controller to select “VMU Manager”. In Dreamshell, you use the analogue stick on the Dreamcast’s controller to move the mouse pointer, or the D-pad to quickly move between icons. Once VMU Manager has loaded, choose the VMU you want to work with using the D-pad. The main VMU Manager window will then appear, as shown in the picture below (click on any picture to enlarge it). The first thing to do is select the SD card as the destination. Use the left analogue stick or the d-pad to highlight the SD card icon and then press the A button on the controller. The screen should change to resemble the one shown below. There are two things you can do now. Firstly, you can copy individual save game files to the SD card. To do that simply select the save game you want to work with in the list on the left, then press the A button twice. The data will then be copied directly to your SD card. Alternatively, you can create a dump of the entire VMU by selecting the icon that looks like a VMU and a floppy disc. In the picture above, the cursor is over this icon. Just select it with the A button and a .VMD file will be created on your SD card containing the entire contents of the memory card. Now that we have the save game files on the SD card, we can come back to the PC and work with them. Power off your Dreamcast and remove the SD card, then insert it into your PC. Open the SD card in Windows Explorer/File Explorer. If you dumped the entire contents of the VMU then copy the .vmd file into the VMU directory in your emulator, or any convenient location on your PC. In Demul, emulated memory cards are usually stored in the “memsaves” sub folder. Now, make sure that file extensions are not hidden. In Windows 8 and 10, you can do that from the View tab of the ribbon. Make sure the box circled in the picture below is ticked/checked. Once you’ve done this, simply rename your file, changing the name from (filename).vmd to (filename).bin. So in the picture above, we’d rename vmudump002.vmd to vmudump002.bin. Windows will warn you that the file “Might become unusable”, but you can safely ignore this warning. Now, all you need to do is fire up Demul again, and from the main window, choose “Config” and then “Maple device manager”. The window shown below will then open. Make sure an emulated memory card is inserted into the first controller by selecting “VMU” in the second box down, just as shown in the picture above. Then, click “Edit”. The following window will then appear. 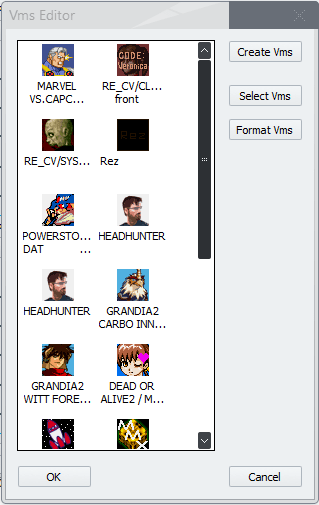 To open the memory card dump you took from the Dreamcast, just click the “Slect Vms” button then browse to the file you renamed earlier (vmudump002.bin in our example). It should open immediately in the VMS editor and be ready for use in Demul. What about individual save games? Working with individual save games is a little more fiddly. Although you can copy individual save games to the SD card in VMU Manager, there’s no easy way we’ve found to use them on the PC. 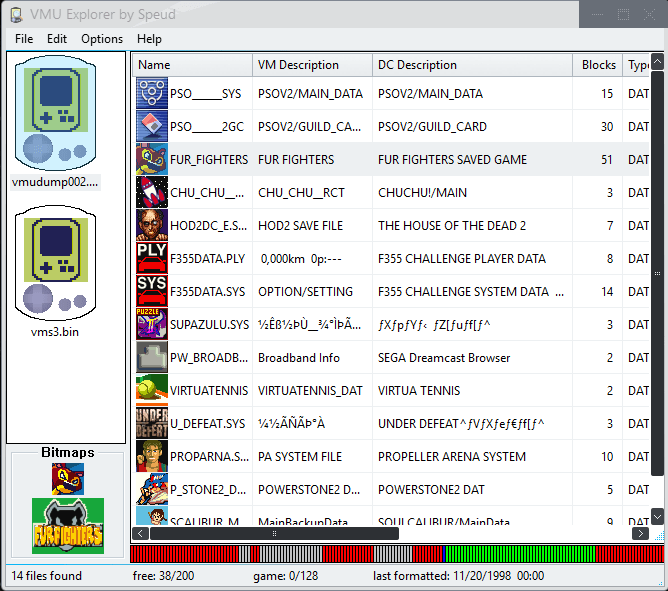 If you want to work with individual saves and virtual memory cards, the easiest way is to use VMU Explorer. You can download that tool here. The file is downloaded as a .rar archive, if you need a free tool to open .rar archives, check out 7-zip. 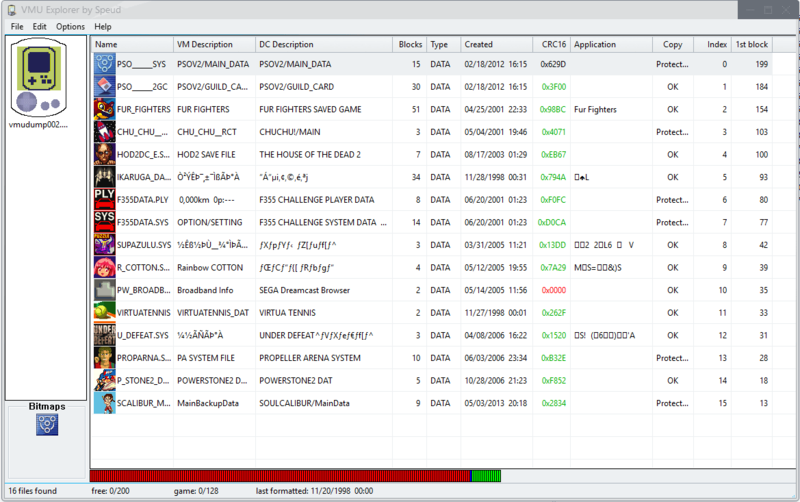 Extract the vmuexplorer.exe file anywhere on your PC and run it. When you start the program it will instantly prompt you for a memory card file to open. Again, browse to the VMU dump you got from your Dreamcast earlier and open the file. You should then see a window like the one shown below. To work with a save game in VMU Manager, simply right click on it. You can then choose “Copy”, “Paste” or “Delete”. If you want to copy files between two virtual memory cards, all you need to do is go to the file menu and choose “Open VM…”. Now, just browse to the virtual memory card file you want to open. It will appear under the existing one in the list on the left. You can now copy and paste files between your virtual VMUs, much like you can in File Explorer. To import an individual save game into a virtual VMU using VMU Explorer, you go to “File” and then choose “Import File”. Unfortunately, to import a single save game onto a virtual VMU requires you to have a .VMI and a .VMS file. When you copy save games using the VMU Manager in Dreamshell, it only generates a VMS file. However, when you export a save game using the VMU Explorer, both files are generated. You can put these files back on your SD card and transfer them back to your Dreamcast using VMU Manager. When you want to export the save game back to the PC, however, you may need to dump the entire Dreamcast memory card then pluck out the save game you require using the VMU Explorer tool on the PC. When you’re done working with a virtual VMU in VMU Explorer, don’t forget to save your changes. You do this by opening the File menu and choosing “Save VMU” or “Save VMU as…”. If you’re really into Dreamcast gaming on both the original hardware and the PC, you could invest in a Dreamconn wireless Dreamcast controller. 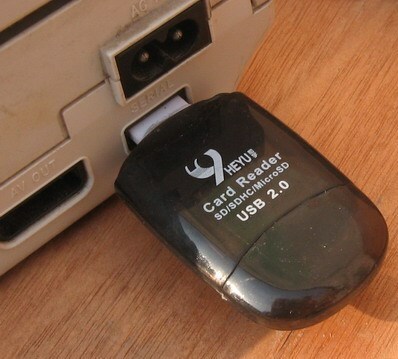 This hardware includes a special tool for quickly transferring Dreamcast save games via Bluetooth. Check out our review of the unit here. Dreamshell can’t see my SD card – Firstly, make sure your SD card reader is correctly inserted. Apply GENTLE pressure to make sure it’s fully inserted. If your SD reader has an LED light, it should be lit as soon as you power the Dreamcast on. If Dreamshell still won’t see the card, it may simply be an incompatible brand. Try an SD card from a different manufacturer. That concludes this tutorial on copying and transferring Dreamcast save games. We were pleased to find our Dreamcast memory units still functioned after all this time and now we have the piece of mind that all our old save games are backed up on the PC too.